Some WeWork locations are going back in time. In partnership with National Geographic, a handful of WeWork spots in L.A., New York and San Francisco will be transported to the 1990s at the beginning of next month, to promote the network’s upcoming show, Valley of the Boom. The partnership promotes National Geographic’s upcoming show, Valley of the Boom. The six-part National Geographic series will make its debut Jan. 13 and will cover the leaders in tech during the rise of the internet age. Some WeWork locations will undergo a transformation to accommodate a so-called Valley of the Boom Internet Café. Desktop computers will feature old-timey games such as Oregon Trail and Tetris. 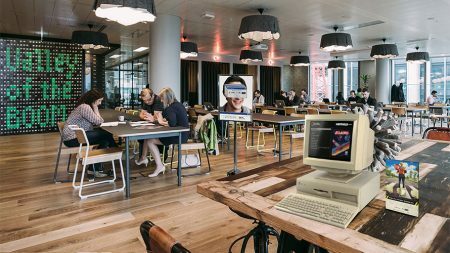 “WeWork is the modern-day start-up garage – a place with a high density of aspiring entrepreneurs who use the shared workspace to bring their big ideas to life in an environment that fosters creative energy. It’s a perfect fit,” said Jill Cress, chief marketing and communications officer of National Geographic Partners, in a statement. The locations will offer members advice on how to optimize their LinkedIn accounts, as well as headshots. Once a member tweets or posts on Instagram using a #ValleyOfTheBoom hashtag, vending machines will dispense candy from the ’90s, as well as trading cards. There will be some ’90s fun, too, with desktop computers with old-timey games such as Oregon Trail and Tetris. Once a member tweets or posts on Instagram using a #ValleyOfTheBoom hashtag, vending machines will dispense them candy from the ’90s and trading cards. The cafés will be in New York at Times Square (Dec. 3), Grand Central (Dec. 4), SoHo West (Dec. 5) and 7th Avenue (Dec. 6); in L.A. at Vine (Dec. 3), Burbank (Dec. 4), Pacific Design Center (Dec. 5) and Playa (Dec. 6); and in San Francisco at Transbay (Dec. 3), Embarcadero (Dec. 4), 600 California (Dec. 5) and Valley Towers (Dec. 6). The campaign was done in partnership with BCXP, the experiential arm of Berlin Cameron. “Companies of all sizes and industries come together at WeWork locations around the world to pursue their life’s work, drink good coffee and thrive. 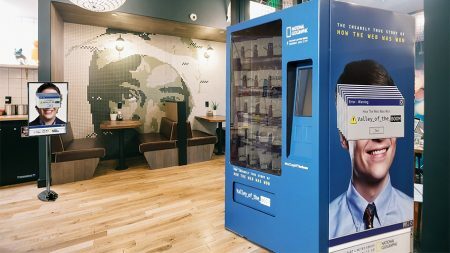 Partnering with best-in-class brands like National Geographic helps us bring them unique content and experiences they can’t enjoy anyplace else,” said Laura Brounstein, vice president of campaigns and content for WeWork, in a statement.